Karen Ibasco from the Philippines is the crowned winner of Miss Earth 2017. The results was announced at the end of Miss Earth 2017 pageant night held at the Mall of Asia Arena, Saturday, November 4, 2017. 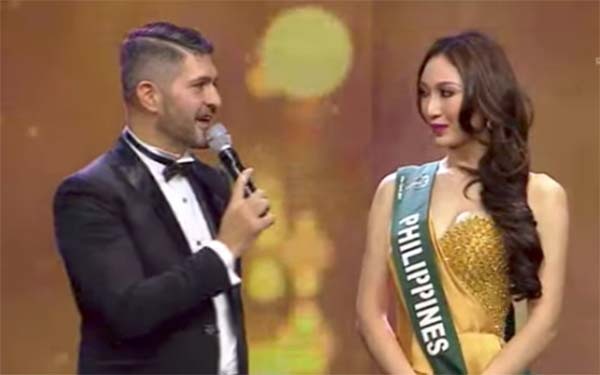 In the defining moment of the Miss Earth 2017 beauty pageant, the judges gave the Top 4 with the same question during the Question and Answer (Q&A) Portion. Below is the video and full transcript of the answers replied by the contestants to the question. Who or what do you think is the biggest enemy of Mother Earth and why? Colombia: The biggest enemy of the Earth is the consumption. We all have to rethink about the consumption because so many industries are really polluting our Mother Earth. We have to rethink of what we eat and buy so we can help Mother Earth. Australia: The biggest enemy of Earth is those people who do not believe that climate change is real. Because for them they do not see the long term effect of climate change and global warming. For me, I would like to keep educating more people and raising more awareness because sometimes they are not just aware of it. As an eco-warrior and all the girls on stage, this is what we should do. Philippines: I believe that the real problem in this world is not climate change. The real problem is us because of our ignorance and apathy. What we have to do is to start changing our ways to start recalibrating our minds and redirecting our steps. Together as a global community, our micro effort will have a macro effect to help save our home, our planet. Russia: The most serious enemy of Mother Earth are us. We must rethink of our conduct to help Mother Earth.